This clear, cold evening provided from my location the opportunity to observe and sketch the straight line row of small craters from Linne A to Linne G. All five of these craters range from three to five kilometers in diameter. 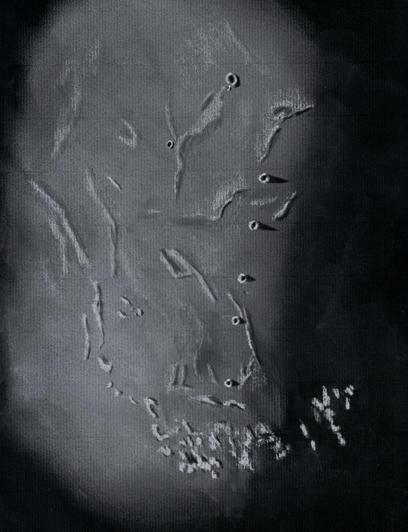 Other yet smaller craters were spotted during brief moments of good seeing but were not included in this sketch. Near the top center of the sketch the sixth bowl shaped crater Banting (5 km.) is clearly visible. South is up in the sketch so the Little Linne sequence from top to bottom is A ( 4 km. ), B ( 5 km. ), F ( 5 km. ), H ( 3 km. ), and G ( 5 km.). What especially caught my eye here on the floor of Mare Serentitatis were the fine, long shadows from each of these little craters. Compliments for this wonderful sketch! Frank this is a very impressive rendition of a large area and very interesting feature just look at how regular the spacing of those craters is and the straightness of the line, not to mention the way you have caught those rim shadows. Great worcks Frank!! You are the best. in this moment i have 40 cm of snow and snowing without end…. Thank you both for your kind remarks. I enjoy especially seeing the beautiful sketches rendered by both of you. Giorgio, I missed your remarks on the day this sketch was posted. Thank you. You really got a surprising bout of cold winter weather. Best to you and good sketching.